A gathering of Conchs surrounded me. No. I was not skin-diving in The Bahamas. I was having dinner in Key West at a beautiful home. And I was happily encircled by some of the smartest, funniest people I have come to call friends. 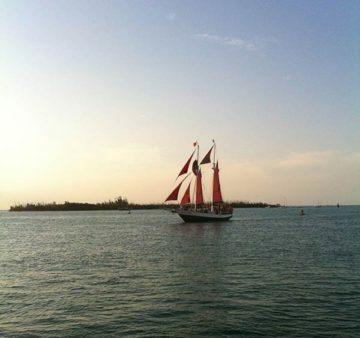 As many of our South Florida listeners know… folks who are born in Key West are known as “Conchs”. My son Justin is one in fact. And now too is my Grand Daughter, Audrey. The subject turned to childhood food loves…as it so often does after the first … or second! …glass of wine. We were lit both by candles and a setting sun but the longest lasting light was memory. And guided by these we shared stories of what my table-mates remembered about growing up and eating in the homes of the paradise island town. I have cooked in South Florida my entire adult life. So discovering evan an obscure term for a dish gets less likely with each passing year. When I come across one it’s like finding a rare stamp for some…or coin or baseball card for other collectors. I’m giddy when it happens to what I collect…and it happened at that table. A lovely, lifelong resident of Key West named Sheila passingly referred to a dish called “Cut Up”. I had to stop her! And patiently she retraced the dish so named. I think she was shocked I had not heard of it. Then she was happy. What could be better than sharing something we love in food with another? Sheila told me of the “pot luck” process of ‘Cut Up’. Conch Families would come to whomever’s home was hosting a party and bring their contribution for ‘Cut Up’. It is kind of free-form salad made in a large, communal bowl. (hence the name!) vegetables such as ripe tomatoes, avocados, bell peppers, cucumbers….dressed in a bit of vinegar or, even better, “Old Sour”! Some families with delicious fruits like guava, mango or avocado…and certainly picked from their own backyards… were allowed to take the ‘Cut Up’ in that direction. It is reminiscent of song craft when one bold person creates a stanza and then another equally brave one seeks to add in… and…if the crowd approves…acknowledging it improved the dish. I have not had ‘Cut Up’ yet but I imagine it to be like gazpacho. I tend to like almost EVERYTHING…as long as it is prepared really well. Sweetbreads, oysters, anchovies are all fine by me! But Kingfish is often either smoked or… thrown back. And grits? Oh that is also another divider! Especially by the name, ‘grits’….call it ‘polenta’ and not nearly so. But when you grow up with something provided for by your family your allegiance can be devout. Sheila fell into that camp and I can see why. When she described ‘Cut Up’ I could also see how it made sense going with the Kingfish and Grits. Kingfish is a bit ‘oily’. Grits are creamy and nurturing. With the raw and textured ‘Cut Up’ adding a nice harmonic and acidic elements the meal only needed one more touch our party agreed… another glass of wine!